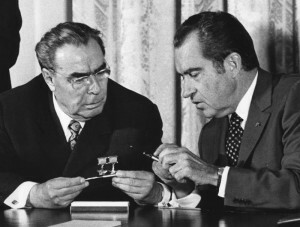 The Nixon administration needed to make many adjustments in order to prepare for strategic arms limitation talks with the Kremlin. One change was in the terminology used to describe how US nuclear forces were supposed to stack up against the Soviet Union. If we have to start over again with another Adam and Eve, I want them to be Americans; and I want them on this continent and not in Europe. The Nixon administration was in a quandary. The Kremlin was not about to accept or acknowledge American strategic superiority in the SALT negotiations, even if Washington enjoyed qualitative advantages in all three legs of the Triad. At the same time, SALT skeptics were going to be up in arms if the administration backtracked from the goal of strategic superiority. What to do? 1. Maintain high confidence that our second strike capability is sufficient to deter an all-out surprise attack on our strategic forces. 2. Maintain forces to insure that the Soviet Union would have no incentive to strike the United States first in a crisis. 3. Maintain the capability to deny the Soviet Union the ability to cause significantly more deaths and industrial damage in the United States in a nuclear war than they themselves would suffer. 4. Deploy defenses that limit damage from small attacks or accidental launches to a low level. It means that it’s a good word to use in a speech. Beyond that, it doesn’t mean a God-damned thing. Just finished reading Terry Terriff’s “The Nixon Administration and the Making of U.S. Nuclear Strategy,” which emphasizes the delay between the coining of the phrase “strategic sufficiency” and the actual strategic and doctrinal changes it was meant to represent. The whole thing is an interesting example of how the political, the bureaucratic, and the strategic interact to produce new policy.